Previous image, 37 total items. Next image, 37 total items. So you’ve for five minutes to get this getaway in the bag. Well, that’s 300 seconds and Fiji has a tiny island for every one of those seconds. 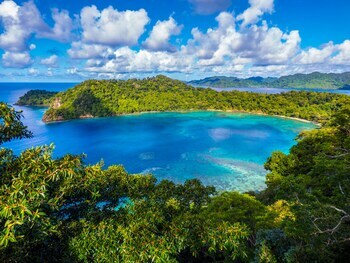 Located in the South Pacific, this tropical archipelago is known for its underwater landscapes, extreme sports—wanna zip-line through the rainforest?—and red-hot nightlife that actually involves fire. Fiji holidays also tend to involve eating and drinking out of coconuts. Mmm. 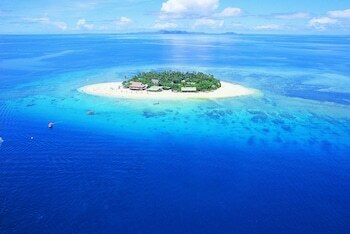 Should we start naming off islets or are you already scoping out the Fiji holiday packages? Oh, you’re already in your bathers? Let’s go! Before you start your busy schedule of chilling the heck out, know the lay of the land, or lands. The two largest and busiest islands are Viti Levu—home of the capital city, Suva—and Vanua Levu, where you’ll find events and attractions when you aren’t scuttling around in the ocean. Speaking of…grab snorkelling gear and dip into the Somosomo Strait located between Taveuni and Vanua Levu. There you’ll find Rainbow Reef, which feels like being at an underwater Pride parade. 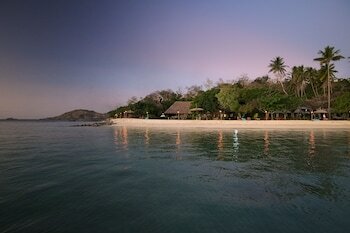 If you want, you can spend an entire Fiji holiday doing absolutely flippin’ nothing and love it. 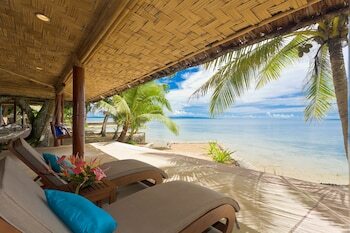 Just roll out a towel on Natadola Beach on Viti Levu, lie face-down and bake for two to three hours until golden, turning frequently #winning. Switch from aquatic to cultural immersion at Fiji Museum in Suva, a breezy bungalow-style venue chock-a-block full of ancient artefacts and present-day art. Keep the dream holiday rolling like the Fijian hills with a hike out to the Garden of the Sleeping Giant, near Nadi on the northwest coast of Viti Levu. Wondering how to get around? 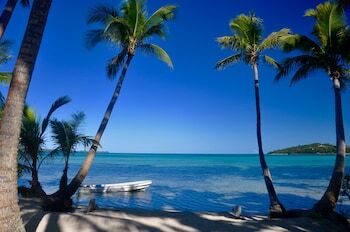 Keep moving with one of our cool Fiji car hire deals on land and catch a ferry when you need a good float. 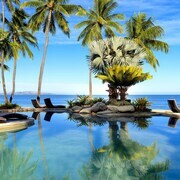 You’re going to Fiji, home of colourful flora and friendly locals, so opt for the open-air social shopping scene. After you’ve scored a gorgeous haul of fresh flowers and handmade gifts at Nadi Produce Market and Suva Municipal, you’ll be extra glad you found Fiji holiday deals here first. Oh, look, there’s a glass-blowing shop in Korotogo, Viti Levu, too. Looks like you have birthday gifts covered for the next year. If you didn’t burst from all the bazaar treats, don’t worry. 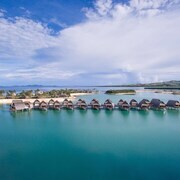 For a sit-down meal of distinctly Fijian flavours with a side of sea views, go to Nadi or sail west to nearby Denarau Island and get a little fancy. OK, a lot fancy. Whether you want to drop it like it’s hot or pick it up like it’s cool, stick around in Nadi’s Martintar neighbourhood or Port Denarau after hours. For a rowdier racket, go south to Suva, where you’ll encounter the local uni crowd blowing off some steam or making some by keeping the tradition of fire walking alive and well. That is so hot right now. 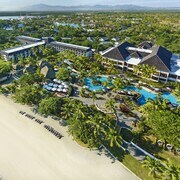 Bundle up cheap travel deals with lastminute.com.au Fiji packages. 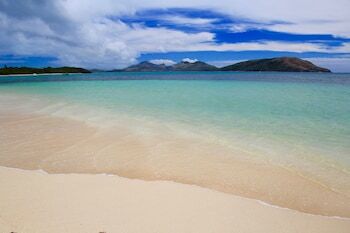 Accommodation and airfares better be all you’re bundling up, because Fiji is all about warm breezes, bikinis and budgie smugglers. 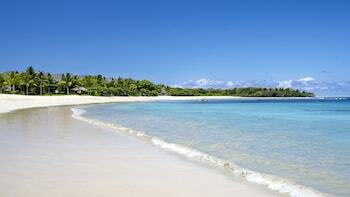 You’ve probably heard a lot about Fiji. The beaches are gorgeous, the palm trees are plentiful and the coconuts are…extra coconutty. Known the world over for its excellent dive spots and chill vibes, this island nation may be small, but it’s kind of a big deal. 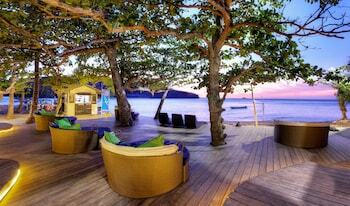 Looking for the inside scoop on local Fijian flavours and fun? 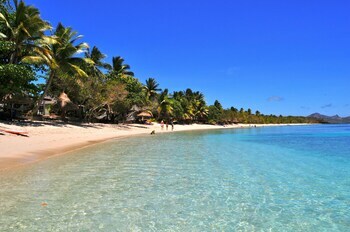 Book a holiday to Taveuni, known as “the Garden Island”, and pack your flippers, mate. Take a day trip to this small atoll to enjoy watersports and spot turtles, take leisurely walks or experience a traditional Fijian ceremony. Staff is friendly, but they should have maintained more cleanliness. 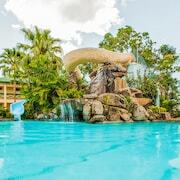 This is a great hotel with amazing staff and a wonderful relaxing feel. Really great food and and service second to none. Thoroughly recommend this hotel for any families looking to give their kids memories that will last a lifetime. Fri., 23 Aug. - Wed., 4 Sep. Thu., 1 Aug. - Fri., 16 Aug.